This month’s blog is courtesy of the very dapper team over at Whitfield & Ward who create beautiful, bespoke tailored suits as well as stocking a number of gorgeous suits for hire. Founded by husband and wife team, Craig and Nicola, in 2012, they noticed a gap in the wedding market for good quality hire suits. Their business has expanded with demand and now also offer bespoke tailoring services. Choosing a wedding suit can often be a difficult and overwhelming decision for a groom, and one of the hardest things can be knowing where to start. Whitfield & Ward do a fabulous job styling our groom models at our catwalk events (see last year’s Wedding Edit!) and my (clearly) very stylish other half, photographer Jonny Draper, needs no excuse to don his sleek and chic Whitfield & Ward jackets or suits at any occasion. So, I thought a guest blog would be something our LOVE brides would be eager to read about and share with their husbands to be. With so much focus on the dress, the venue and the flowers, choosing the groom’s suits can perhaps get forgotten in the wedding planning process. The groom’s suit will be a major feature in your wedding photography so it’s important to get it right! At Whitfield & Ward we’ve helped thousands of couples create their dream look. Putting ourselves in the lucky couples’ shoes, we’ve compiled a list of questions that will help you decide which suit will work for you, and how the planning process can run as smoothly as possible. Help! My fiancé has no idea what kind of suit he wants to wear for our wedding and is looking to me for advice. What should I say? Brides will have spent years thinking about that special dress for their big day, and will have plenty of ideas, fantasies and inspiration to work through before they find the right one. The same can’t always be said for grooms. Encourage your fiancé to do some research before he commits to anything. Pinterest, Facebook and Instagram are a great place to start. The time of year you are getting married will have a practical impact on the fabric your fiancé chooses. One great tip for a summer wedding is to consider a waistcoat under a jacket. 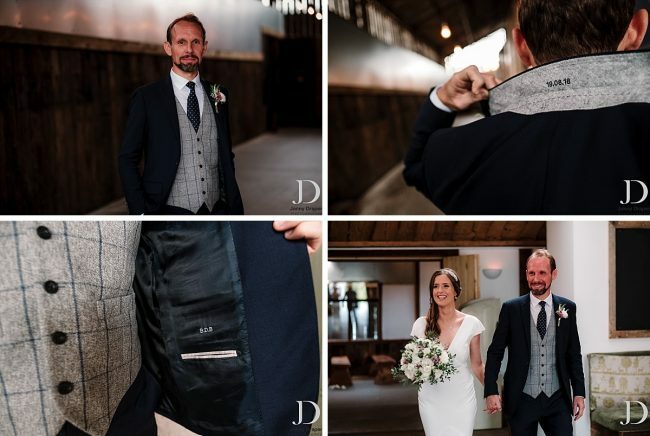 If it is a warm day, jackets will be removed pretty quickly, and a waistcoat means your groom remains looking smart and put together all day. The groom’s suit should reflect the style of the venue, tweed is a perfect match with a rustic barn style wedding, a tuxedo looks slick and stylish in a fancy hotel wedding. Although it can be difficult, try not to impose the theme of the wedding too heavily on the groom. The groom should complement the theme while simultaneously looking stylish and masculine. Let the groom speak to their tailor about the colour scheme of the wedding and work out how they can harmonise his look. We also think the groom should stand out from the crowd, it’s easy to spot the bride, it should be the same for the groom. Choosing a different colour tie from the groomsmen, or a different colour waistcoat is a subtle way to do this. My fiancée never wears a suit. He has no idea what style, colour or cut suits him. What should he do? A bride to be will try on numerous dresses before she finds ‘the one’, why should it be any different for the groom? We recommend visiting a suit shop and committing some time to try things on. It is worth the time and effort; a great fitting suit will boost a groom’s confidence on what is one of the most important days of his life. At Whitfield & Ward, we’ll guide our grooms every step of the way, advising on the styles and colours that complement his build and flatter his skin tone. Our role is to listen to his ideas, advise where necessary and work with a groom to create a wedding look that makes him feel amazing. My fiancé knows what kind of suit he wants, but should he hire it or buy it? The answer to this mostly comes down to budget. It’s more cost effective to hire suits than it is to buy them. However, a bespoke suit is a treasured possession, something made just for your husband to be that can be used many times after your big day. A compromise, and something we’ve seen a lot of in recent years, is grooms choosing a bespoke suit for themselves and hiring for their groomsmen. Our range of hire suits are made to the highest quality, from 100% English and Italian wool, and come in a range of cuts to suit everyone. When should we start the wedding suit hiring/buying process? Typically, brides start thinking about their wedding dress 12 months before the big day, and we would recommend doing the same with wedding suits. It amazes us that many wedding calendars suggest this should be done only three months before the wedding as this leaves no time for tailoring, adjustments or collaboration between the groom and his groomsmen. To ensure that we deliver an amazing personal service, we limit the number of weddings we cater for each weekend. This means that key dates fill up fast, so we recommend coming in to see us as soon as possible to avoid disappointment. If your groom is planning on hiring wedding suits, we’d suggest starting the process around nine months before your wedding date. For those planning to buy a suit, we’d suggest starting the process much earlier. A suit can be designed and delivered in four months, but we’d advise having the first appointment at least six months before so there’s plenty of time for fittings and to enjoy the experience. If your groom still hasn’t found his dream suit or he needs some help and advice about this all important purchase, please get in touch with us, so we can help you both explore some options. Give us a call on 01625 536 545 and we’ll handle the rest. Thank you so much Whitfield & Ward for this amazing advice, I can hear the sighs of relief from confused brides and grooms to be everywhere! So, now that the groom is sorted, perhaps it’s time for our LOVEly brides to start thinking about their wedding dress again. To make an appointment, email us at hello@lovebridalboutique.co.uk.